Healthy morning, lunch, or dinner inspiration, Quinoa Bowls bring sunshine to the day. 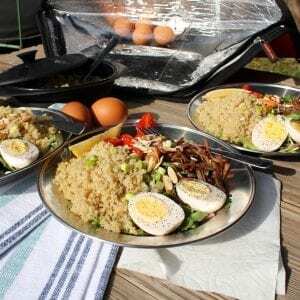 Place 1 cup quinoa to 2 cups water, and however many eggs that are desired into the Sunflair® Solar Oven for 1.5 hours. Cover bowl, and place eggs on the tray next to the pot. Plate with a bed of arugula or other greens, quinoa, hard baked eggs, and let your imagination inspire with tomatoes, scallions, avocado. The salt in bacon, ham, or some lunch meat is nice, perhaps some hearts, nuts, etc. for crunch. Tie it all together with a squeeze of lemon and pepper. 😋Serve 3-4 people, and enjoy! * Brown eggs will cook faster, since dark colors absorb heat more than white or shiny objects. But no worries, white eggs cook too.